Unlike most other vegetables in your garden, planting rhubarb will occur only once every 10 years or so. Because it is a perennial plant, it will come back year after year on it's own. When fully mature, a rhubarb plant may reach 5 feet or more in diameter. Because of their size and longevity, choose an out of the way corner or edge of your garden. The location needs to be in mostly full sun where the plant can grow undisturbed for several years. A mature plant will produce 3-4 pounds of edible stalks per year. Rhubarb is planted using crowns. A crown is basically a rhubarb root system that is about a year old. They can be purchased from a variety of local, mail order and online retailers. If you have a friend that has a well established rhubarb plant, you can dig it up and cut off a crown to plant in your garden. It is possible to grow rhubarb from seeds. However, this will extend the time to harvest by an additional year. If you choose to start with seeds, plant them 1/4 inch deep in flats filled with potting soil. They will take several weeks to germinate. Keep the soil moist and place the flats in a sunny, indoor location. Begin this process about 12 weeks before the ground first thaws in the spring. The seedlings can be transplanted when the soil is thawed and workable in your garden. As soon as you are able to dig in your garden, it's time for planting rhubarb. Dig a hole 1 foot deep and 1 foot wide. Fill the hole with a mixture of garden soil and compost or well rotted manure. If you live in an area with dense soil, you can put down a layer of rocks at the bottom of the hole. The combination of rocks and compost will help the soil drain properly. If the crowns sit in waterlogged soil for very long, they will begin to rot. 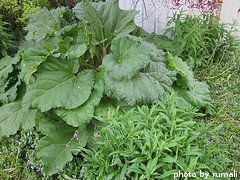 Additionally, rhubarb plants are heavy feeders and the compost/manure will give the plants a jump start. Once the hole has been filled in with the soil/compost mixture, use your fingers and dig 3 inches deep into the mixture. Place the crowns into this new hole and cover with the soil/compost mixture until it is level with the surrounding soil. If you are planting more than one rhubarb plant, space the crowns at least 6 feet apart. Once you've finished planting rhubarb, water the crowns in well and keep the garden soil moist throughout the spring and summer. When air temperatures reach above 80 degrees F, apply a 2-3 inch layer of mulch around the plant. Leaves, straw, compost or grass clippings all work well. The stalks will begin to emerge when the soil temperatures warm. If you see any flower stalks, remove and discard them immediately. 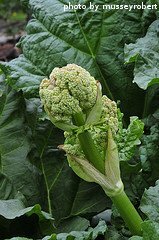 These flowering stalks are easily identified because the flowers resemble heads of broccoli. 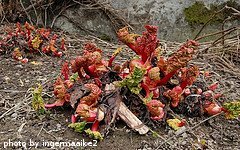 They should be removed because you want your rhubarb plant to focus it's energy on producing edible stalks, not flowering ones. Do NOT harvest any rhubarb the same year that you plant it. This will allow the leaves to produce food for the plant. These nutrients will help the rhubarb plant develop a strong root system that will greatly enhance stalk production in future years. Now that you're done planting rhubarb, it's time to learn about watering, fertilizing and harvesting your crop.